I honestly thought the #NeverTrump guys had already hit rock bottom. I didn’t see how much further down they had to go in making themselves look foolish and idiotic. I figured this post was the last I would ever write on the die hard #NeverTrumps. 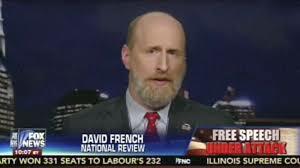 The editor of The Weekly Standard, Bill Kristol, whose record of inaccuracy on political predictions over the past year is probably unmatched in modern punditry, revealed this week that his long search for a Great Write Hope is fellow pundit David French, a writer at National Review. If there is a better example of how insular the pundit class has become I couldn’t imagine what it would be. The pundits, gazing around at the political field, decide to dispense with the actual voters and select one of their own. The genesis of an Acela Corridor campaign is the utter failure of the chattering classes to understand the rise of Donald Trump or…well anything that’s happened in the past year. And yet they continue to insist that they’re the best and brightest and know what they’re doing. Of course their Acela Putsch is doomed to failure. The world will never be ready for Punditocracy. The few hundred votes that they represent are insignificant, but the fact that they can command TV news time brings attention to them way out of their importance. Meanwhile, they’ve had years, generations even, of being taken seriously. But who is going to take them seriously now; ever? This entry was posted in Politica and tagged #NeverTrump, Bill Kristol, David French, Election 2016, Great Write Hope, National Review, Punditocracy, Republican Civil War, The Weekly Standard. Bookmark the permalink. Absolutely, who would ever take them serious; they’re insane idiots! Looking forward to January 2017 inagauration of President Donald Trump!! With God’s guidance, he will make America great again!!! I hope Trump has the editorial staffs of National Review and The Weekly Standard on the very front row at the inauguration.